Kingdom is a sidescrolling strategy/management game that just launched on Steam, where it’s been in and out of the top ten best-sellers for the past day. It’s not hard to see why: true to its regal nature, the game’s got luxurious graphics and this feeling of almost elevated grace about it. Your horse does not gallop or canter; it strides. The world around you is lush and lively, and details—reflections in the river, puffs of exertion from your exhausted steed—abound. Kingdom’s design is similar: minimal yet elegant. There’s not even much of a UI. Everything’s contextual. Your goal? To build up a kingdom and survive nightly assaults from creatures who want to rob you blind, take you from prince (or princess) to pauper. Thing is, you’re completely defenseless. As a king or queen, all you can do is ride around on your horse and throw money at things. Your subjects, however, can handle themselves well enough, provided you’ve put everything in its proper place for them. Upon receiving coin(s), subjects will join you (and slowly trudge to your base, where they’ll pick up a tool and get to work) while structures will magically sprout scaffolding for either construction or upgrades. Builders will eventually take care of the rest, as long as you’ve put money into churning out a few hammers for them to use. Defending your base works the same way; buy some bows or scythes, get some people to walk to your base, and everything else will take care of itself. That’s basically it. That’s the entirety of how you play Kingdom. By and large, it’s downright slick—the closest thing I’ve played to a pick-up-and-play strategy game. Kingdom’s story might—like everything else about it—be minimal, but there are strange forces afoot, old mysteries stirring where human eyes can’t see. I want to explore more, to understand the bones lying just beneath my glorious empire. Kingdom has, however, irked me in a few ways. For one, it almost explains too little. On my first playthrough, I even managed to miss a crucial moment where I was suppose to build a wall, and that sequence-broke the whole game. I then spent five in-game days totally unable to build anything at all, and—predictably—monsters ate everybody. Kingdom is also a pretty slow game. Sometimes that means it’s relaxing—a zen-like lake chill out simulator—but other times I can’t help but wish that someone would kill something and get me more money, or that baddies would try to huff, puff, and blow down my door already, or that getting from place-to-place on my asthmatic horse didn’t take so damn long. Granted, when things do become action-packed, they’re all the more impactful for it. 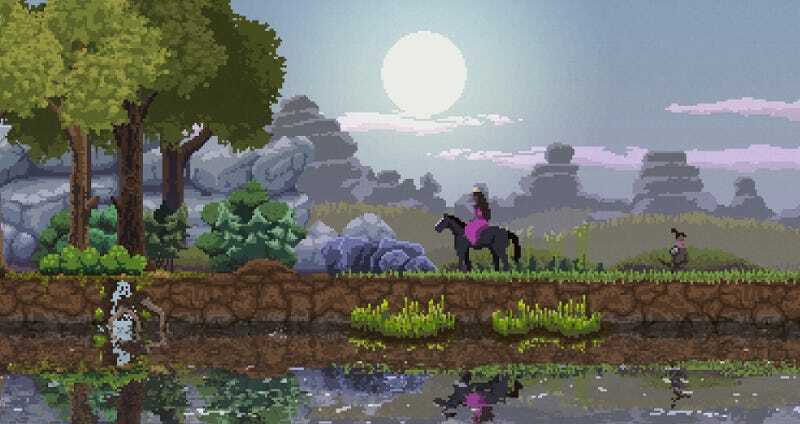 Kingdom’s mixture of serene scene-setting and piercing blasts of action (wherein you are, again, helpless and have to anxiously hope that your base holds up) makes for a unique pace. Even when I’m taking in a gorgeous sunrise, I’m the teensiest bit anxious. The pace did, however, become something of an issue after I died and had to start over a few times. Surviving the first ten nights or so became a cakewalk—a very slow cakewalk. The game fell into a predictable, sometimes monotonous pattern. I wasn’t bored, per se; I just wanted to get back to feeling like I was making progress. Oh, and subject AI that’s sometimes dumb as rocks further exasperates that. Sure, they’ll pick up hammers or bows or scythes reliably enough, but after that it’s tough to corral your subjects into sustained usefulness. You can’t directly order them around, after all. They just do their own thing according to their roles. After a few hours of playtime, I’m definitely enjoying Kingdom, but I can’t help but be frustrated by it at the same time. In that sense, it’s much like, well, a coin. One side is elegantly designed, relaxing, and gleaming; the other is tarnished by design flaws, AI problems, and a lack of clarity. But then, that’s leadership for you. You can throw all kinds of money at problems, but time won’t speed up or slow down for you, and people will never stop being people.